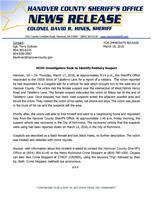 Hanover, VA – On Thursday, March 17, 2016, at approximately 9:14 p.m., the Sheriff’s Office responded to the 15000 block of Taliaferro Lane for a report of a robbery. The victim reported he had responded to a Craigslist add for a vehicle for sale which brought him to the west end of Hanover County. The victim met the female suspect near the intersection of West Patrick Henry Road and Taliaferro Lane. The female suspect instructed the victim to follow her to the end of Taliaferro Lane. Once stopped, two black male suspects exited the adjacent wooded area and struck the victim. They robbed the victim of his wallet, cell phone and keys. The victim was placed in the truck of his car and the suspects left the area. Shortly after, the victim was able to free himself and went to a neighboring home and requested help from the Hanover County Sheriff’s Office. At approximately 1:45 a.m. Friday morning, the suspect vehicle was recovered in the City of Richmond. The recovered vehicle that the suspects were using had been reported stolen on March 12, 2016, in the City of Richmond. Suspects are described as a black female and two black males, no further description. The victim was treated and released with minor injuries.